Planning a wedding can be very hectic and time consuming as you juggle organising your big day alongside the demands of everyday life. A huge aspect of this planning is selecting and styling the right venue from the many choices available. So the ability to find help with this is crucial to being able to make it through the wedding planning stage stress-free. One such option is to hire a marquee for your wedding reception. Contrary to popular belief, choosing a bespoke marquee can be less work than the alternative bricks and mortar venue. Not only does it offer you freedom on where you choose to have your wedding (a large back garden, the ground of an historic venue or in a field with views of the coast), you can also hand over the organising and planning of your event to seasoned professional such as Marquees and Pavilions. By handing over the reigns of organising your venue to the experts, you can free up your time for the more exciting tasks of deciding where to honeymoon and what you’re going to wear. 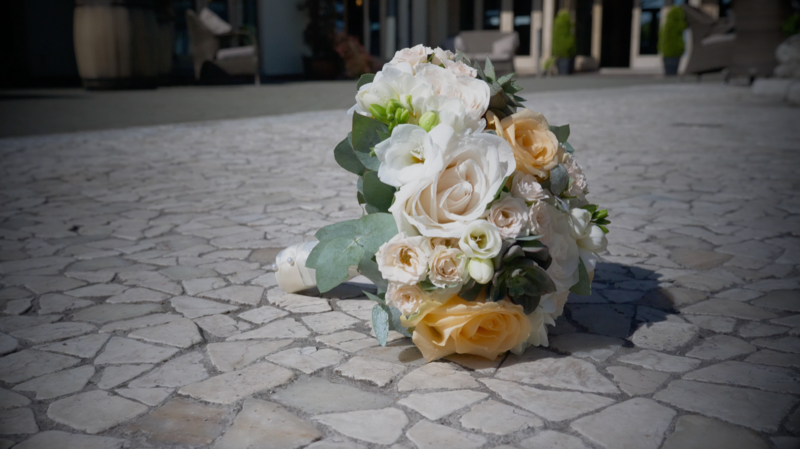 Having organised a wealth of weddings before you, they can help guide you through the day and take care of everything from designing the ideal venue, to making sure it’s equipped with everything you need for your special day. If you’re thinking of hiring a marquee for a garden wedding, here’s our guide what you need to consider. The size of the venue so we can provide the right size marquee to fit the space available. Type of garden. Is it grass lawn or patio/hardstanding? Does it slope or have any large trees or shrubs or garden features. For example, fountains and statues could be enhanced by lighting or even included within the marquee as a feature! Access to and from the garden so we can establish how best to transport/carry the marquee equipment onto the site. If there is a power supply available from the main house or whether we will need to use a generator. Your bespoke requirements such as style of the marquee, what type of lighting is preferred, catering area required, loos required etc. Available budgets so that the size and style of the marquee can be tailored to fit the budget available. There is no extra cost for the site visit. Once the above has been confirmed we will go away and come back to you with whole list of questions to finalise the design. This is where you start making decisions on how you want your perfect wedding venue to look and feel. First we will let you know the potential size of the marquee available for your garden, which in turn gives us the maximum number of guests that your marquee can cater for. By using modular marquees – our marquees are built in 3m section – this gives you plenty of options for increasing and decreasing the marquee in size and design to ensure all your guests fit in comfortably. Then we ask you to choose your flooring from the selection of matting, wooden floor with carpet or cassette flooring. Depending on the ground of the site we may have to suggest the best flooring option. If the ground is soggy or uneven, we would suggest the wooden flooring and carpet option to keep the marquee floor level. If the ground has a particularly steep gradient a cassette floor would be necessary. Once these details have been finalised we get on with designing the bespoke drawing of your marquee and garden. The drawing is to scale which will help you when it comes to planning the finishing touches. We will be sure to include plenty of windows if your site has spectacular views or incorporate outside lighting to highlight particular garden feature or areas of the grounds. Following the site visit and the initial drawing we provide you with a detailed quote with no hidden costs, that also includes any delivery charges. Once the initial drawing has been finalised the fun begins! You are now in charge of choosing the perfect lining, lighting and dance floor to fit with your theme. We have multiple options to make your marquee unique to you and are happy to provide you with lots of ideas. No two of our marquees have ever been the same! Once you have agreed the plan and made the booking, you can leave the rest to us! Depending on the size of a marquee it can take from 1 – 3 days to build & approximately 1-2 days to take down. We inform and discuss install and de-rig dates directly with the clients to ensure it works for everyone. 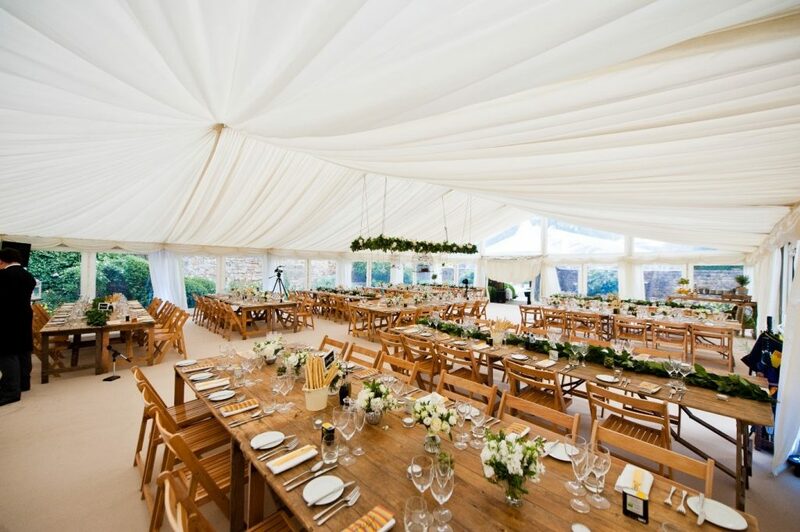 Should you wish to find out more about hiring a marquee for a garden wedding please feel free to call Marquees and Pavilions to speak to one of our experts. We’re more than happy to provide you with guidance and ideas based on our many years of experience, or to arrange a site visit so that we may prepare you a quote. You can call us directly on 01844 208 371 or get in touch via our contact form. Planning – the initial planning is the key, if you have thought through the process thoroughly from the start then the rest of the plans “should” run together smoothly. Budget – we appreciate that some potential clients do not wish to discuss this particular point but it can be very helpful for ourselves to ensure that our quote is within budget and realistically achievable. 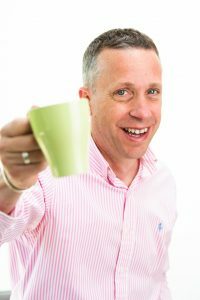 Communication – don’t be afraid to call us if you have any questions, we have a wealth of experience and establishing any issues and resolving them quickly is the best way forward. We will always have productive and constructive answers to help towards resolving any issues. 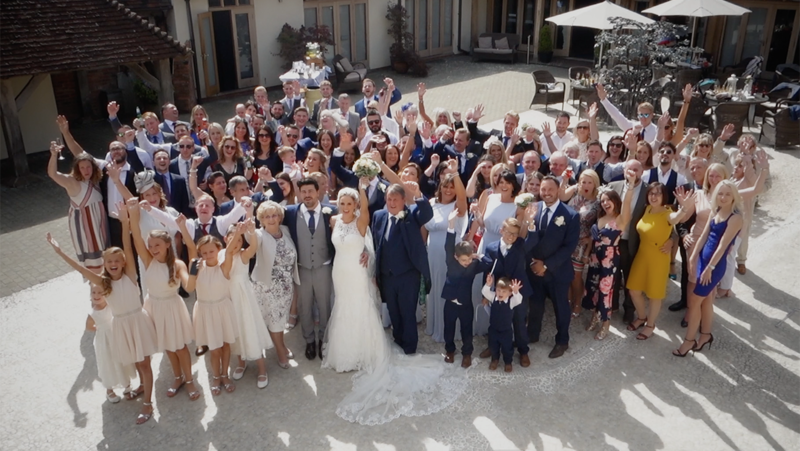 Power Requirements – it is helpful to know how much power everyone will be using in the marquee, for example, the caterers, band/DJ, photo booths and chocolate fountains etc. Last thing you want is someone plugging in an appliance and it overloads the system! A rustic wedding is a favourite theme that we’re asked for time and time again by clients. With the laid-back, carefree atmosphere it brings to the celebrations, this is a theme that fits with a marquee wedding perfectly and offers endless opportunities when it comes to styling your large open space. 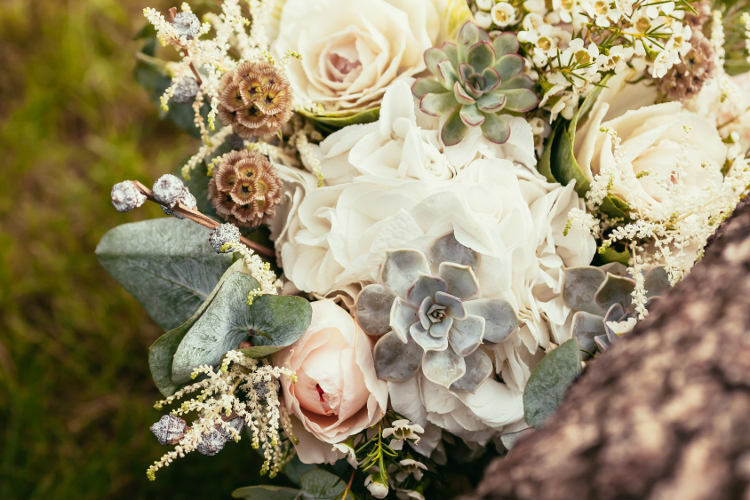 We also love the fact that the homemade and handmade feel of a rustic wedding, brings the opportunity to get family and friends involved in bringing your wedding plans to reality. Vintage trestle tables accompanied with wooden folding chairs or a selection of vintage chairs complements the rustic look and really help set the scene. Leave the table without tablecloths so diners can see the natural patterns and textures of the wood. Set the tables with pretty vintage crockery and table decorations sourced through local antique shops or specialist vintage suppliers. The tables from the image above are from Linda’s Vintage Hire. Linda is one of our regular suppliers and has a fantastic collection of vintage furniture, props, china and crookery to help theme your wedding. 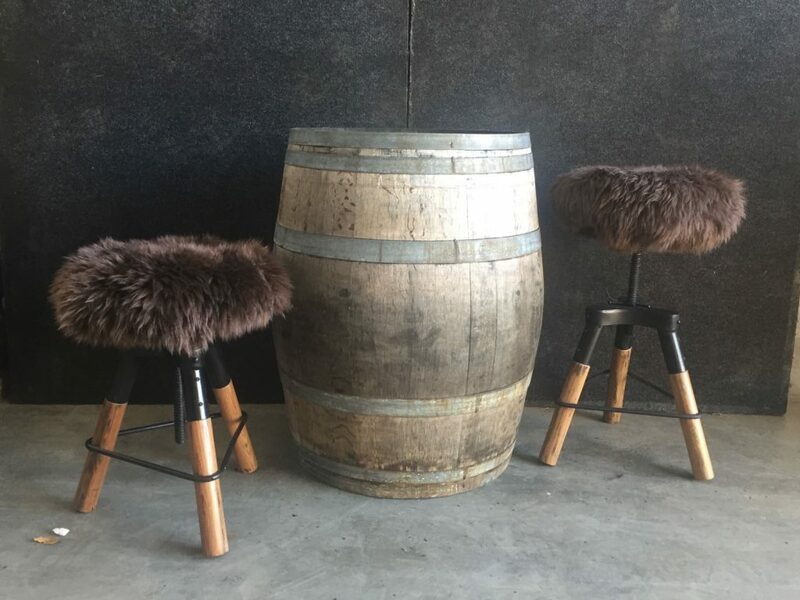 Around the bar area, look for something quirky such as the oak barrel and adjustable fur topped bar stools. 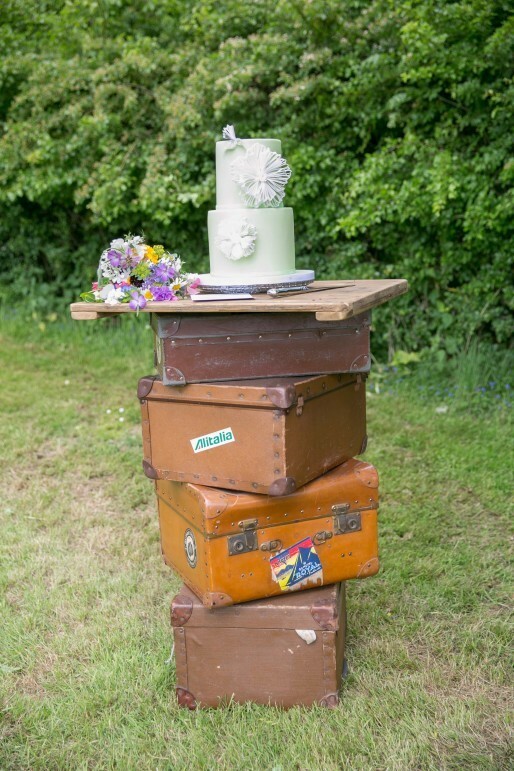 A stacked suitcase bar table can double up not just as somewhere to rest your drinks, but also as a stand for holding a large floral display in a vintage vase, candelabra or even the wedding cake. 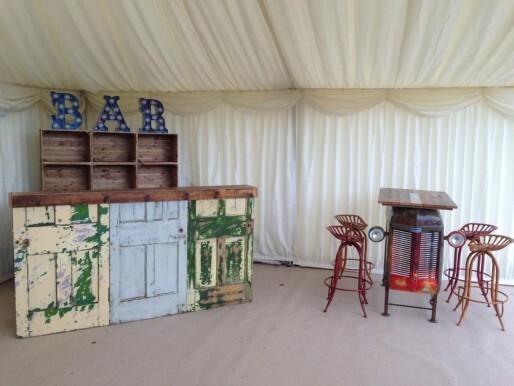 One of the most asked for requests we get is finding a rustic bar from which to serve up retro cocktails and drinks. Luckily our supplier Elite Hire has one! 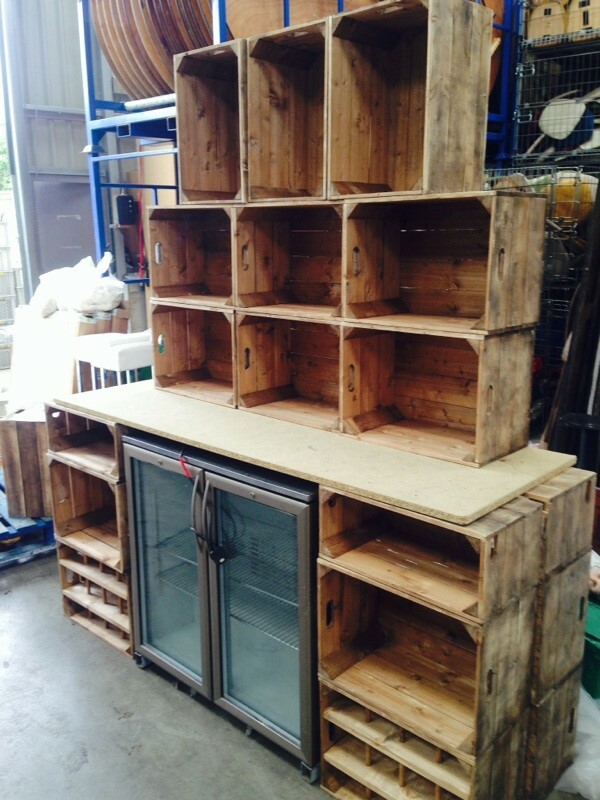 We also love how wooden apple crates have been used at the back of the bar for storing glasses and bottles. Alternatively, if you are feeling adventures why not check out how you could build your own, after all rustic and home made go hand in hand. For creative inspiration we found some brilliant examples of how others have been building rustic bars on Pinterest. Building a rustic bar for your wedding could even be a great project for the groom and his friends to get involved with. Hanging floral features are looking set to become a very popular trend. When you are thinking about your flower decorations to compliment your rustic theme make sure you keep it simple and earthy. The beauty of rustic wedding flowers is that they are meant to look looser, more organic and not manufactured down to the finest detail. Aim for something natural and romantic, that looks like been freshly gathered from the garden. Another brilliant opportunity to get creative and make your own. Check out Pinterest for inspiration. The best back drop to a rustic look is our ivory pleated lining on both the walls and ceilings of your marquee, giving you the perfect blank canvas to dress as you wish. To complement the pleated lining we suggest using simple ‘nut’ coloured matting or carpet on the floor. For more inspiration and ideas for how to bring the rustic feel to your wedding day please feel free to speak to us here at Marquees and Pavilions. Call us on 01844 208 371. Marquees as a wedding venue are becoming increasingly popular, particularly during the summer months. They offer a most versatile space which allows you to create a wedding to match your individual style and personalities. 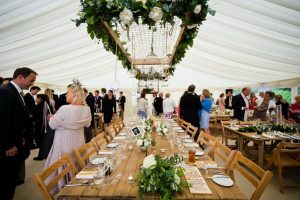 To help you plan the most perfect summer marquee wedding, we wanted to share with you a few things to think about when planning your event. First to consider is the location. Marquees can be built in your back garden, grounds of a manor house or in a field. In fact, pretty much anywhere there is enough space. If you have a site in mind you need to make sure there is vehicle access, so your marquee can be set up. You’ll also need to think about parking for your visitors on the day. Next are the practicalities. Is there water, power and toilets? No power is no issue, as we can provide your venue with a generator. 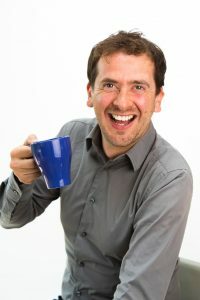 If there is no water supply, you should discuss this with your caterer, so they can make arrangements. Toilets can be set up with no water supply. Whilst your wedding is planned for the summer, do you want to make arrangements for additional heating should it turn cooler in the evening. Then you can move onto the design. When it comes to size and shape you can have pretty much whatever you like due to the bespoke nature of marquees. Consider how many people it needs to comfortably hold. Do you want a separate area for dancing, eating, greeting, chilling, or an open plan area that fits all needs. What’s your budget? This will also affect the size and scale of your plans. Once you have your design agreed, you can decide on decorations. As marquees offer a blank canvas, the sky really is the limit to what you can achieve. But remember you’ll have to think about every detail. A good place to start is to get the foundations in place first. This includes everything from the layout of the tables and the chairs, to floor coverings and ceiling drapes. Then you can have fun with adding the finishing touches with your choice of tableware and glasses, floral arrangements and the thoughtful little extras that make all the difference. And don’t forget the lighting. Here the opportunities are endless whether you go for extravagant chandeliers, strings of fairy lights, to flickering candlelight, it can make a real difference to the end result. Be sure to think about the exterior lighting as well, particularly as the views from the marquee are just as important as the interior. On a more practical note, lighting the route to the toilets and the car park is extremely helpful for guests. Cost is another consideration when planning your day. To help with preparing and budgeting for yours, we’ve also provided an outline of estimated costs of hire packages for a range of different sized marquees we provide. When you use a marquee hire company like ourselves, we provide everything you need to give you a temporary venue for your event. Our service includes a site suitability survey, bespoke marquee design and supply and build of the structure, complete with flooring, linings and drapes, lighting and heating, electrical distribution and power supply. We also supply dining furniture, outdoor furniture, lounge furniture, dance floors, stages and bar. If you need event loos, we can do that too. We can also provide help and guidance with choosing your suppliers and can recommend local wedding planners, caterers and photographers. For more ideas, check out our portfolio and be sure to follow us on social media too. When planning any kind of celebration, whether it’s a birthday party, an anniversary or your wedding, hiring a marquee could be the best venue option. As a venue, marquees are incredibly versatile, allowing you to create an event exactly as you want it. You don’t have to limit your guest numbers, you can build a space to meet your needs, use your chosen catering company and create the décor to meet your wildest dreams! Imagine a beautiful countryside or stunning coastal setting for a summer wedding, or a winter themed party in your own garden strewn with stunning lighting. Just in case you need any further persuasion, we’ve put together our top 5 reasons why a marquee is a perfect solution for any party. Marquee weddings and parties, offer you the opportunity to entirely design your wedding to your taste. There are no restrictions on how many quests to invite, who to use for catering or where to have the wedding. All you need is a large space, which could even be your back garden or a field. When it comes to how you decorate your marquee, the sky really is the limit. With no restrictions regarding decorations or preferred suppliers to use, you can let your imagination run wild and go to town on interior décor and layout of your venue. With so many themes to choose from, traditional, vintage, festival or beach party to name just a few, you can create something unique and individual, that means something special to you and your guests. Whether you are planning the most elaborate wedding or a small gathering, marquees can cater for all budgets. You can rope in the family to help you decorate the marquee or you can hire a wedding planner to help you make your dream wedding come true. The same is true with the catering. You could hire a sommelier to help you choose the perfect wine list or find your own wine. You can pick the best caterer to wow your quests with the most amazing food or you can do the catering yourself. A marquee is a blank canvas for you to create the most amazing event that matches to your budget. 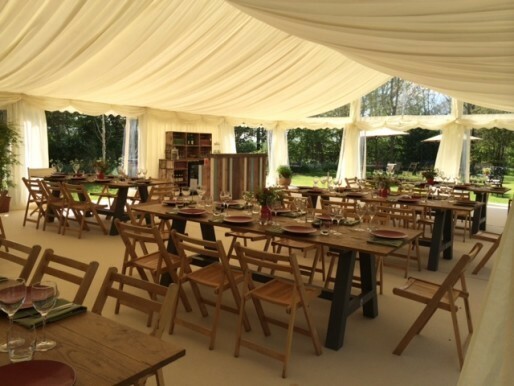 With the help of a specialist marquee team, such as ourselves, you can have your event wherever you decide (subject of course to the permission of the landowner and a site survey). From start to finish our team will help you plan the layout, discuss what extras you might need (a bar area, a dance floor, a chill out room, and not forgetting catering equipment and the loos), build your dream venue and breakdown the marquee at the end of the day. Wherever you decide to locate it, make sure you make the most of the outside views with either a glass or frame marquee. Both of these options provide large clear windows and roofs that allow guests to enjoy the fabulous views whatever the weather may bring. You can party the night away until the cows come home in a marquee! This is your big day and no one should be telling you when to stop the party. When you hire a marquee as your venue, you are free to choose how long the party goes on for. Just make sure your neighbours are invited too! We would be more than happy to have a chat with you with regards to using one of our bespoke marquees as your wedding or party venue. For more information, please feel free to contact us on 01844 208 371, or check out our Pinterest for ideas. Royal weddings are in the news again with the announcement of Prince Harry and Meghan Markle’s engagement. Just a few months ago in May 2017 The Duchess of Cambridge’s sister Pippa also tied the knot. But whereas her sister Kate was married to Prince William in the dark interior of Westminster Abbey and brother in law Harry will wed at Windsor Castle, Pippa got married in a rural church and then had a reception at the Middleton family home in Bucklebury, Berkshire. Despite that sounding like it might have been a bit of a budget affair, the choices that Pippa and her fiancée James Matthews made added up to a truly spectacular wedding. The key choice was the venue. Bucklebury is set in spectacular countryside and the couple wanted the location to be a key element of their wedding. But how to accommodate hundreds of guests when you are planning to have your reception at home? The solution was to hire a modern ‘glass marquee’ for the Middleton’s garden. This wonderful innovation provided them with a huge covered area that kept everyone safe from the elements but didn’t impede the view of the beautiful surroundings. Although called glass marquees, the temporary structures of this type are usually glazed with clear acrylic for safety. They have become an enormously popular alternative to traditional canvas marquees in recent years and Pippa’s wedding will only boost the trend. Marquees these days are modular so they can be reshaped in an almost infinite variety of configurations to fit the available space. If your dream wedding reception location happens to be on a steep hillside, no problem. A modern marquee comes with a self supported floor so guests can dance on a smooth flat floor, no matter how undulating the ground beneath might be. The key benefit of glass marquees for event planners is that they allow the grounds around the marquee to be lit with spectacular colour displays. With the right lights you can achieve a true ‘wonderland’ look that only improves as the night begins to fall. In a traditional tent or indoor wedding all that effort of lighting the garden would be wasted because nobody would see much of it, but in a transparent marquee a beautifully lit garden remains on display throughout the evening. Whether Meghan and Harry opt for a glass marquee in the private gardens of Windsor Castle remains to be seen, but with Her Majesty the Queen’s famously beautiful trees and stunning flower beds lit to perfection, a glass marquee at Windsor really would provide a wedding venue fit for a princess. Should you be planning your own wedding and wish to give it the royal touch, Marquees and Pavilions can help. We offer a wide range of wedding marquees that can be configured to suit any type of venue. For more information about our wedding marquees for hire please feel free to drop us a line with your requirements or call 01844 208 371 to request a free quote. In this age of Instagram, more and more couples are looking for a unique and alternative venue to really show off the individuality of their wedding. Whilst some might jet off to far flung corners of the earth to get hitched in exotic locations, others choose the full on, white wedding experience complete with church ceremony and traditional venue. However, if you’ve got the outdoor space available, one of the fastest growing trends is to host your wedding at home in your back garden by hiring a huge marquee and styling it to meet your wildest desires. Whether you want to go vintage, Hollywood glamour, or craftalicious – there are no limits to what you can achieve. Glass marquees work particularly well as the perfect neutral space where you can really go to town with your décor both inside and out. The large windows that surround the marquee not only allow natural light to flood in, but give guests panoramic views of impressive grounds or buildings. This provides an ideal opportunity to extend your styling outside and into the surrounding area. Lighting in particular can be used to dramatic effect with glass marquees. Done well, it extends your wedding party outside, long into into the evening; highlighting particular features or projecting light shows onto nearby buildings or the marquee itself. 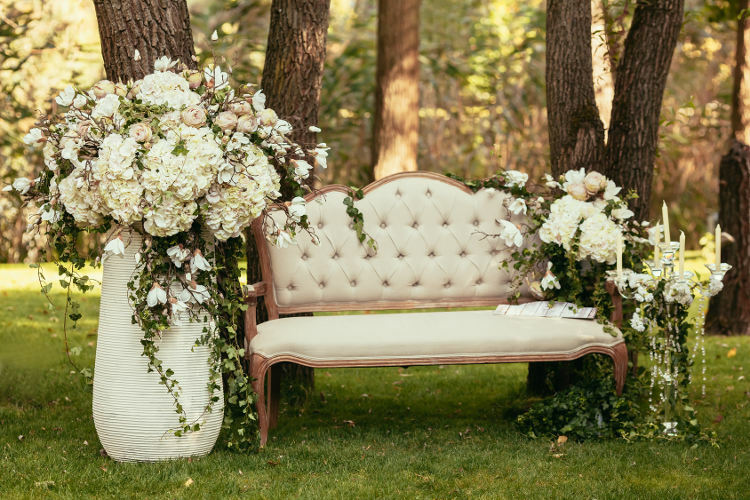 Using foliage as part of your wedding decor remains very much in. We particularly love the woodland look with beautiful bouquets and decorations with plenty of leaves. This not only follows the natural look trend, but is also a lot easier on the budget than most other styles! Good news all around. The 1970s craft, Macramé, is officially back and it is a perfect trend for decorating your venue. Why not involve friends and family to help you create amazing handmade ceremony backdrops or table runners and bunting? If you’re encouraging everyone outside, why not cater to them there too? Another emerging wedding trend is the use of a mobile bar. You can choose from anything from a vintage camper to a refurbished horse box as an additional bar for your wedding party. Just one thing worth bearing in mind with a glass marquee is that it can can get very hot in direct sunlight. This can be easily dealt with by careful choice of where to place it in your venue. Remember, that the sun moves through the day, so a shaded spot in the morning may be in full sun by the late afternoon. 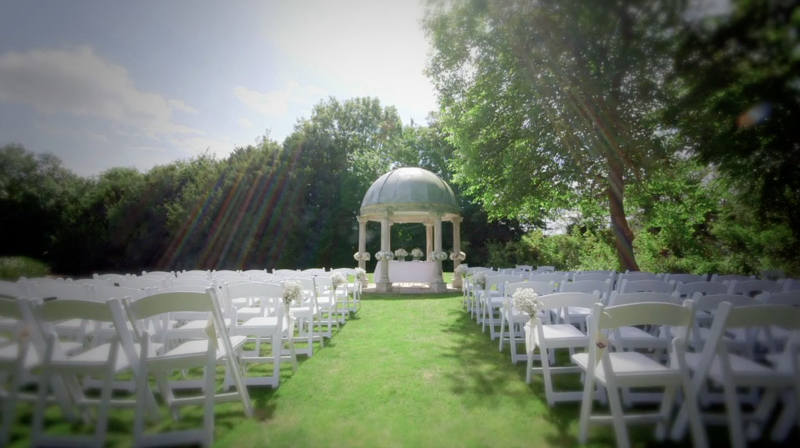 If you’re thinking of organising your perfect “back garden wedding” we are here to help. Marquees and Pavilions have a selection of glass marquees for hire, which can be configured to meet your exact needs. For more info please drop us a line or give us a call on 01844 208 371. We have also compiled an extensive list of frequently asked questions that may help you with your decision making. Most brides favour the summer months for weddings. Granted you get long evenings, warm weather and the pick of the crop for honeymoons dedicated to sun-worshipping. But a summer wedding can also mean stifling hot weather, uncomfortable guests steadily cooking in their suits and serious cases of sunburnt shoulders. Which is why canny couples are shunning the warmer months in favour of winter weddings, and that lovely feeling of hygge that these cooler months bring. If you’re thinking of a winter wedding, how different does your planning need to be? One important aspect of any winter wedding is the venue, and one surprising option works particularly well at this time of year. The obvious venue choice might seem to be a stately home or listed property, complete with oak panelling and roaring fires. However, as attractive as this options seem, they do have their limitations. Depending on the venue you might not be able to have candles or certain decorations for fear of damaging ancient interiors. You’re also limited to the on-site caterer with a fixed array of set menus from which to choose your wedding feast. Then there is the high cost of bar drinks wedding guests are often required to pay in some locations. A clever alternative is to hire a marquee. First and foremost, get the idea out of your head that these are cold, draughty affairs. Modern marquees are capable of withstanding whatever the British weather throws at it, from freezing temperatures to gusting winds, driving rain and even snow. They can also be heated to ensure guests are warm and comfortable. So a marquee is as good as a building right? Well no, a marquee can be so much better! For a start, if you want to really push the boat out with your décor a marquee will allow you to do just that. A marquee interior is a fantastic blank canvas on to which you can project your wildest imaginings for a winter themed wedding. At this time of year, looking to nature for inspiration works really well. Imagine a marquee decked out in tree branches and twigs festooned with lights and berries. Candles twinkling on the table and gold accents to create a warm luxurious feel. Add a bit more opulence with chandeliers hanging from a star spangled ceiling, and throws to add a splash of colour and add a little extra warmth for guests. As for your wedding feast, you’ll find no set menus to choose from here. Instead you can take your pick from a wealth of fantastic caterers so your meals can reflect your individual style and taste. Whether you decide to go formal with a three course silver service meal, to a more casual help yourself buffet or bang on trend street food caterer, everything about your menu can be as unique as you desire. Likewise when it comes to drinks you can carefully select your favourite wine to match your meal, choose soft drinks for children and designation drivers, and ensure there’s a well stocked bar to help your guests party into the evening. Marquees and Pavilions are a supplier of high quality wedding marquees for hire. We have a vast amount of experience in creating beautiful bespoke venues to host remarkable weddings. From start to finish we are with you every step of the way to ensure your day runs smoothly. We start by surveying your location, before designing a marquee layout that includes everything you and your guests will need (including heating, lighting, generators, catering and toilet facilities), through to installation and being on hand during the day itself to make sure everything runs without a hitch. Great news for all brides to be and event planners. Marquees and Pavilions are offering a fantastic 10% discount for 2018 marquee hire bookings that are confirmed by 30 November 2017.